Faction Founders now have access to a "Send all" mail button for their faction. 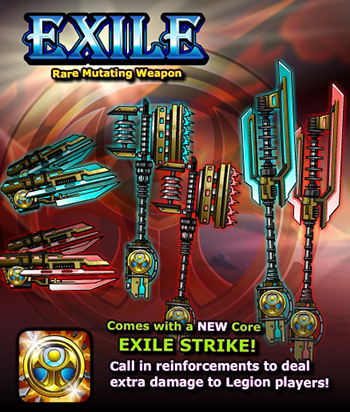 This change is a first step in providing Mercenaries with more of the tools they need. Static Smash - Absorbs energy from the enemy as a percentage of damage done. Costs 0 Energy. As an Energy-generation tool, Static Charge has fallen behind other similar skills. Both the stat scaling and the early-level damage on Plasma Bolt were a bit too high, this should bring it more in line with other tier 1 spells. This change is intended to further mitigate the impact that critical strikes can have in certain situations. This change is simply to put the Blood Mage multi-target skill in the same place as the other classes. Fixed an issue preventing Davarril from being challenged. These items will be available in limited quantities on Davarril. We will also be issuing a final restock on the other LQS items in the war shops. We've made a second pass on the mail system that was introduced last week. This week you will be able to send messages to your friends and fellow Faction members! Don't worry about spam -- the list is restricted to only those on your buddy list and Faction list. You can send a single message to up to 20 recipients! Planning in-game meetings has never been easier! 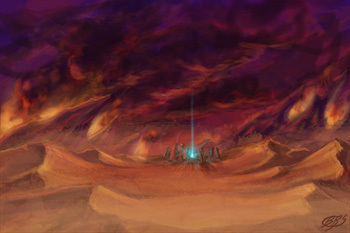 Part of this week has been devoted to preparation of the next grand event. 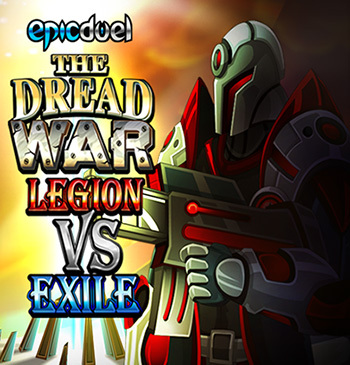 The Legion and Exile forces have been engaged in a stalemate since last summer, when The Lawman and his fellow Exiles stormed the Delta Vault and seized a secret army of hibernating androids, taking the Legion administrator Silas captive in the process. Now, with Davarril subdued and no external threats to postpone further conflicts, the drums of war are once again echoing across Delta V. Legion and Exile forces are rallying around a new battlefield to determine the fate of the planet. 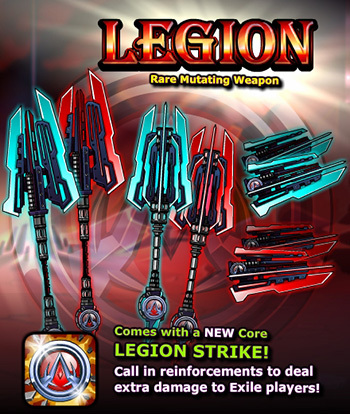 Legion and Exile smiths are working double-time for the war effort. Which side will you choose? Will you fight for freedom with the Exiles or fight for order with the Legion? The time to choose is quickly approaching. This is it! The final round! The atmosphere has been purified and Davarril is a sitting duck...er plant...robot...thingie. The point is, you can attack him directly without worrying about being infected by his spores -- involuntarily at least. Davarril is carrying a huge and terrifying experiment, the Botanical Borg. The unique twist with this beastly bot is you don't just summon it, you become it! 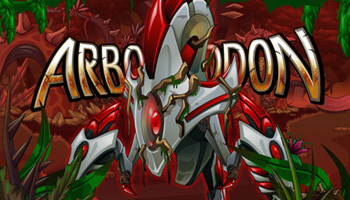 Unleash a devastating Spore Blast or the new multi-target Spore Bombardment attack! I'm not sure why Davarril is selling this monstrous creation. Maybe it's a sneaky, last ditch attempt to lure you over to the dark side? Trizzzy has done it again! That's right! 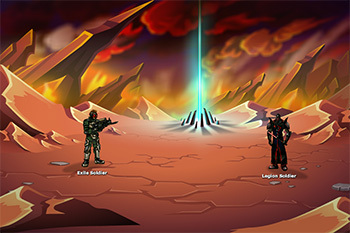 Dage the Evil has returned to Delta V! Well, I guess he never left, but he's bringing two amazing new items crafted in the nightmarish forges of his Undead Legion domain. 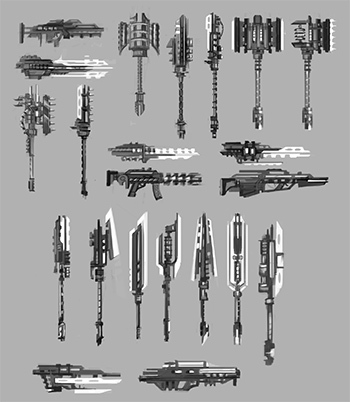 Remember, we are not responsible for any corruption of your soul that may result from using these bazookas. Dage Weapons don't have safety switches. 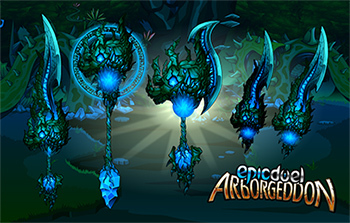 Like all of Dage's other items, these will be Limited Quantity, so be sure to dash to Dage's location in the Minetower as soon as we go live with the new release to secure your 'zooka! While you've been occupied cracking botanical skulls (figuratively, of course), we've been building a new in-game mail system. In this iteration, you will be able to receive important system messages and account updates. Guide new players through game features as they level up. 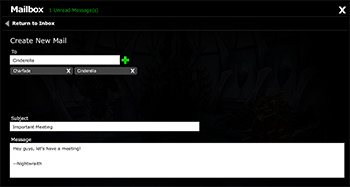 Receive a notice about receiving in-game prizes and achievements, especially those that do not have a prize screen. Notify players about exciting game news. Provide details when a disciplinary action has been taken. Eventually allow player-to-player communication. This will be limited to friends only. Again, when this features first goes live, you will only be able to receive messages. 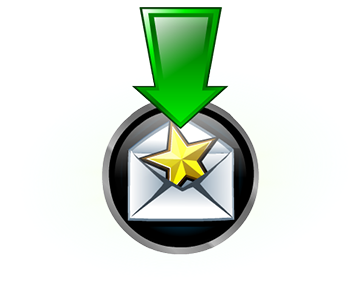 We intend to include the ability to send mail from player-to-player as soon as next week. This is the first iteration of the EpicDuel mail system, so be sure to let us know what features you would like to see (or not see) in future updates! I would like to take this opportunity to congratulate one of our Mods on a very special promotion. Our veteran Mod, Alley Cat, will be ascending to the role of Head Moderator while Cinderella focuses on writing and pursuing her PhD (congratulations!). It's a big responsibility leading a large team of veteran and new Moderators, but we're confident Alley Cat is up to the challenge! 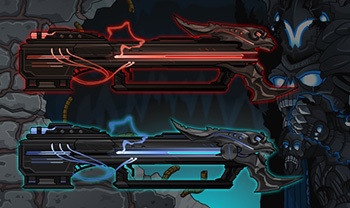 These next few weeks leading into summer we will be focusing on developing and implementing major features to improve the quality and longevity of EpicDuel. None of these will be as ground-shattering or time consuming as Omega, but they will be oft requested features such as an improved mission interface, a core shop, and improved Faction Wars. This summer should be very exciting as these key features are implemented over the Omega framework to create a dynamic, action-packed game experience! Davarril Boss Battle will enable once the air purification War Bar reaches 100%. Arbor Annihilator achievement for defeating Davarril. Tiered Spore Hunter achievements for collecting and releasing Purified Spores. These will be awarded automatically as soon as Arborgeddon concludes. Ability to purchase Botanical Key outright from Davarril for quicker access to War Shop. Added a new passiveLink field to allow action icons and action buff graphics to be differentiated. Split the ItemBox data response into 4 separate responses to minimize login timeouts. Dramatically reduced the size of the mission data table that downloads when logging in (~80% reduction). NPC credit rewards now limited to 100 wins per day. Fighting lower level NPCs decreases credit rewards by 3 per level instead of 4 per level. In other words, you now get 17-32 Credits based on level, up from 12-32. Fighting NPCs more than 5 levels lower still awards no Credits. Drop rate on Purified Spores increased to 15%. Base damage on all Robots has been increased by 3. Damage per Focus has been reduced from 6 to 4. Davarril thought taking over Delta V would be a walk in the park, but the diligent duelists have kept his infestation confined. Players are working day and night collecting purified spores to heal the Biological Preserve and take the fight to Davarril himself. Once the War Bar reaches 100%, there will be nothing stopping you from delivering justice to the rogue Archivist. 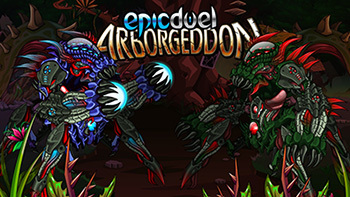 You'll have to tackle this challenge alone, but if you succeed you will be rewarded with a Arbor Annihilator achievement! Beware, Davarril has many tricks up his moldy, metallic sleaves so this fight will not be easy! Meanwhile, Cinderella's war shop will be supplied with a shipment of new "Infested" armors and an awesome Botanical Bike, designed by Trizzzy! Also, rumor has it that Davarril is tempting players over to the dark side by offering a Botanical Key for sale. 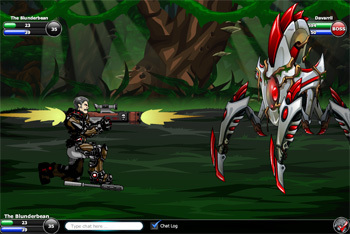 This will allow you to access the war shop without collecting the required spores and completing the required mission. Collecting spores is a dangerous job, but somebody has to do it. It makes sense that those who are especially adept at collection should receive a reward for their efforts. These tiered achievements will be awarded for in 10, 30, and 100 Purified Spores. Do you have what it takes to become a Superior Spore Hunter?